The Fives Downtown Hotel & Residences Curio Collection by Hilton has an ideal location in the heart of Playa Del Carmen. Visitors of this hotel only need to take a few steps out the door to check out nearby restaurants, bars and shops. Exploring the area is great, but guests will be happy to retire to the comfort of The Fives' spacious rooms. The accommodations include modern luxuries such as refrigerators, TVs, air conditioning and coffee makers. They also include complimentary high-speed Wi-Fi and a private terrace or balcony. The moderate rooms offer a courtyard view and start at 389 square feet. Perfect for sleeping two adults. A jump to the Superior room will offer a little more space which might work better for a family or a couple needing a bit more room. The rooms have a chic design with the perfect amount of vibrant color accents. The suite options offer 200 more square feet and come with a terrace or private patio. Some suites even include a separate living room area and a kitchen. These rooms are great for longer stays. The Fives even offers two-bedroom suites to host families or groups of six comfortably. A couple celebrating a honeymoon or anniversary might think about choosing an ocean view suite. These rooms also have plunge pools or whirlpools for added luxury. 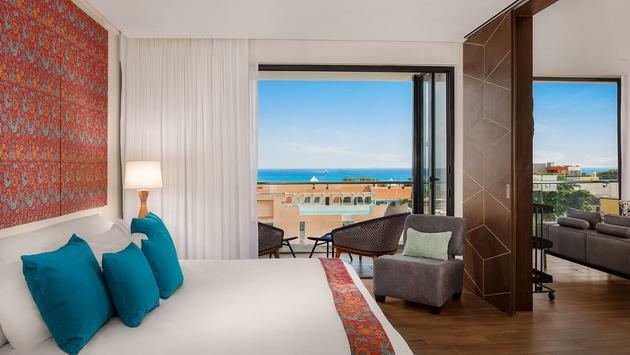 For the ultimate luxury option, guests will want to look at the two-bedroom penthouse ocean view room which includes a private pool overlooking the city and ocean. It’s truly top of the line. This room sleeps four adults comfortably. No matter which room option guests choose to book, it’s sure to be a comfortable stay. Click here to learn more about the room details at The Fives Downtown Hotel & Residences Curio Collection by Hilton.